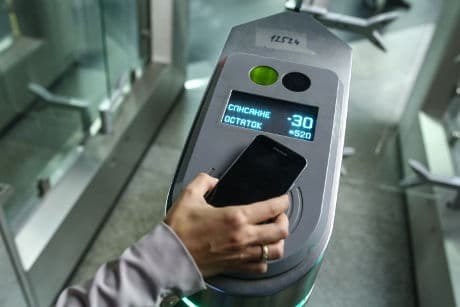 Subscribers to Russian mobile network operators MegaFon, Beeline and MTS can now pay for travel on public transport in Moscow using their NFC smartphone. The project has been implemented by the Moscow Department of Transport, Moscow Metro and MegaLabs, a subsidiary of MegaFon. “The Mobile Ticket service makes it possible to pay for journeys from a subscriber’s mobile account by just touching the phone against the ticket reader; a Troika card will now be built straight into their mobile phone’s SIM card,” MegaFon says. “It’s free to connect to the service and there is no monthly fee. “To pay for travel on public transport by phone, subscribers need to have an NFC-enabled device with a special SIM card that supports the technology. Once the SIM card is installed, the subscriber will receive a text message suggesting they use the Mobile Ticket service. If the subscriber agrees, then 150 rubles [US$2.20] will be debited from their mobile account and credited to their Mobile Ticket account. Moscow’s Department of Transportation revealed its plans to install NFC subway turnstiles for mobile payments in 2013. Sberbank ran an NFC payments ticketing trial in the city in 2010 and Moscow Metro was scheduled to launch an NFC service with MTS in Q4 of the same year.